Looking for a Windows Live Writer Replacement? Anyone remember Windows Live Writer? It was pretty much the best blogging client available for many years…if you were a Windows user. If you use a Mac, there haven’t been any good free options. Until now. My good friend Den Delimarsky is setting out to build a cross-platform blogging client for Windows, OS X, iOS, and Android. It’s called Alki. No ETA on availability, but he’s got some cool features planned according to his website. If you’re interested in signing-up to test Alki when it’s available, go to http://dennisdel.com/alki/ and sign-up from the home page. Author TomPosted on September 13, 2015 Categories Apple, Google, Microsoft, SoftwareTags Alki, Android, Apple, Blogging, iOS, Microsoft, OS X, Tumblr, Windows, Windows Live Writer1 Comment on Looking for a Windows Live Writer Replacement? Yesterday, I recieved a G1 from T-Mobile to try out and play with. The G1 is the first phone to offer Google’s Android Operating System. The design and purpose of the Android operating system is to encourage openness and innovation. The G1 is a 3G phone which means that data connections will be significantly faster than traditional EDGE connections. So far after 24 hours of use, I’m impressed with Android and with the G1 itself. The G1 weighs in at about 4.1 ounces and has a solid feel. The G1 uses an HVGA (480×320) touch screen, and for someone like me whose has big fingers, the screen is very responsive, and I’ve had very few errors with using the on-screen keyboard. This coming week I’ll be in Las Vegas for the International Consumer Electronics Show, and I’ll be making the G1 my phone of choice for the week. Photo gallery will be posted soon and look for full review series over the new few weeks! 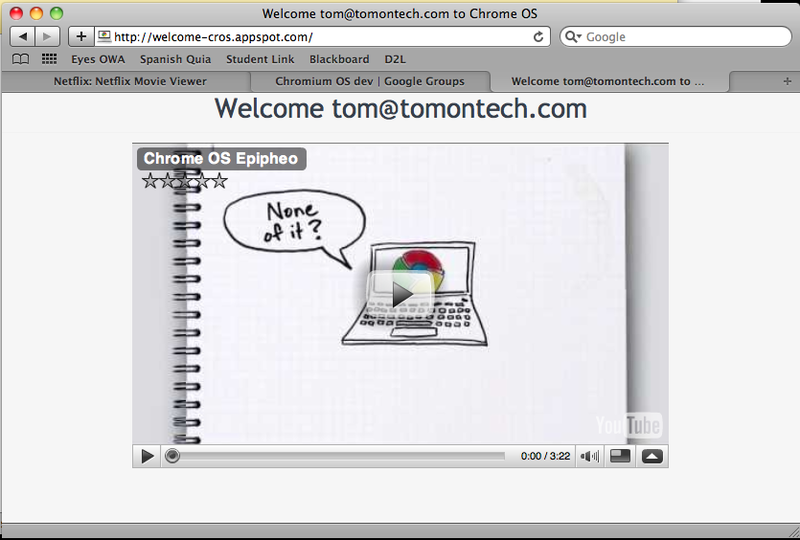 Want to try Google Chrome OS? If you want to try out Google Chrome OS, I’ve compiled a build, code is current as of Friday the 20th. 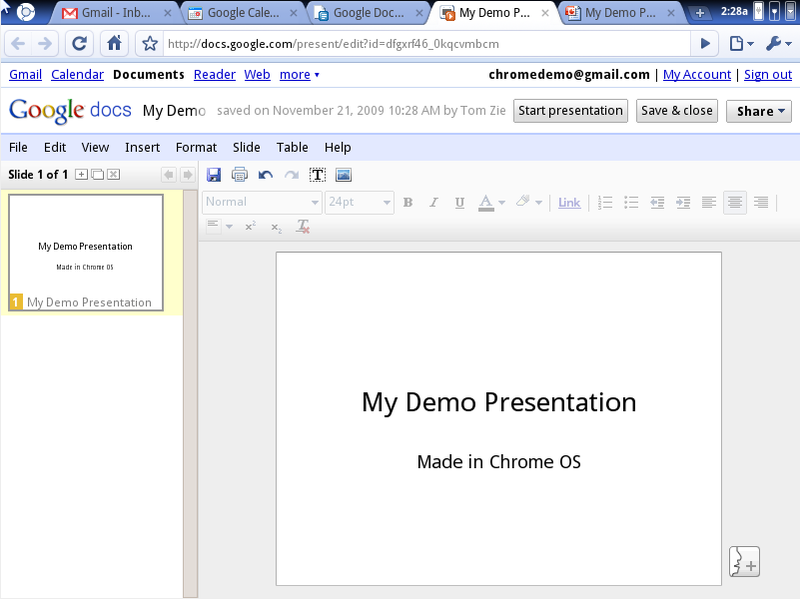 To test out Chrome OS, you’ll need either one of the VMware products (Player, Workstation, Server) or Sun VirtualBox. I recommend Sun VirtualBox, as I have not had much luck with getting networking to work with VMware Workstation on my PC or Fusion on my Mac. This is very early pre-release code not meant for production use. You may experience some bugs. Feel free to go to http://code.google.com/p/chromium-os/issues/list and report anything that you find. If you are unable to get networking to work, or you feel uncomfortable using your personal information (I promise that I did not and do not include any malicious code in this build. It’s not my way of doing things), I have enabled a local user account. To use it, type “chromeuser” for the username and then leave the password field blank. 6. Click Add, and then browse to the location that you saved the Chrome OS VMDK file. 7. After reviewing the details, and making sure everything is correct, then click Finish. 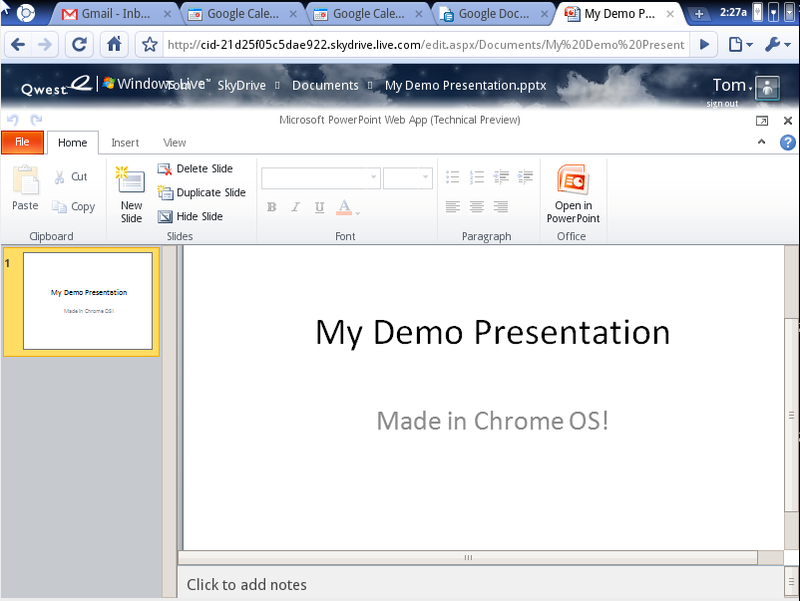 Once you’ve created the virtual machine, you can then click the start button and begin to play with Chrome OS. 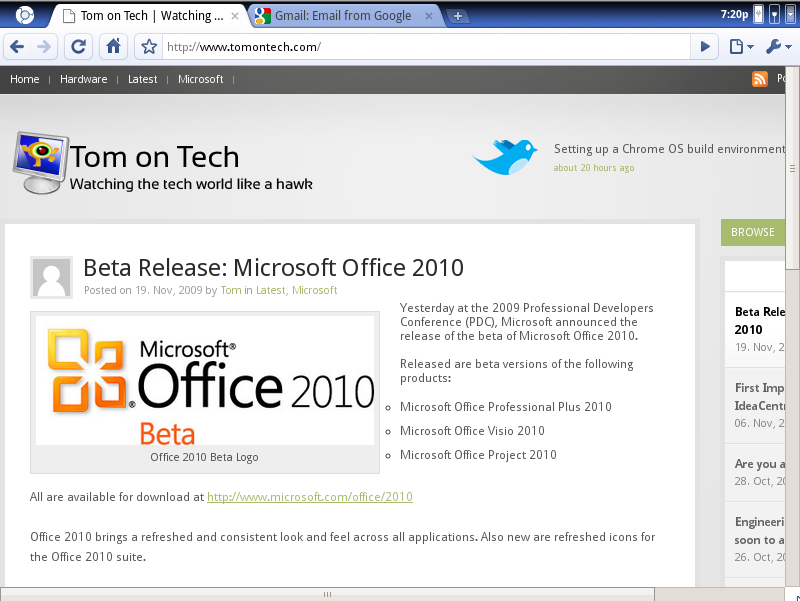 Author TomPosted on November 22, 2009 Categories Google, LatestLeave a comment on Want to try Google Chrome OS? 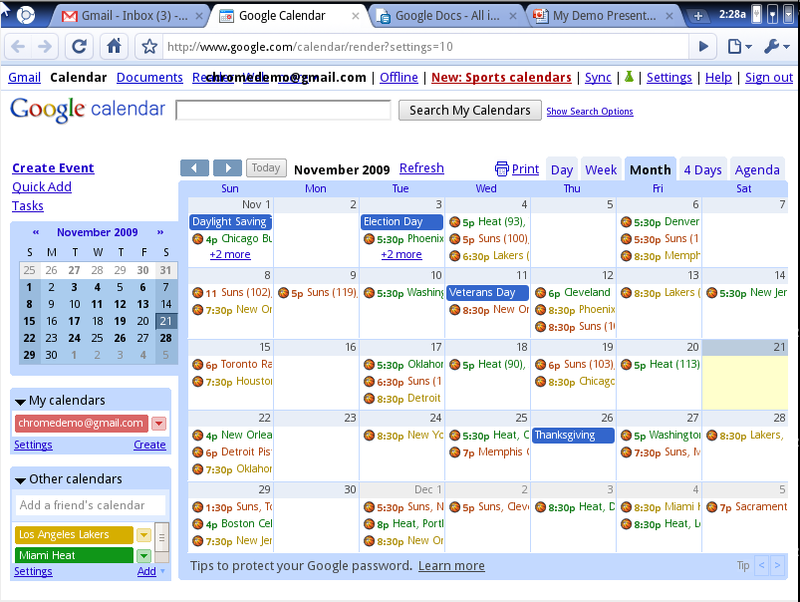 On Thursday, November 19th, Google opened up Chrome OS to the world. Currently there are no official downloads, however, Tom On Tech has downloaded and compiled the source and produced a Virtual Disk file for use with either VMWare or VirtualBox (personal preference for Chrome OS). 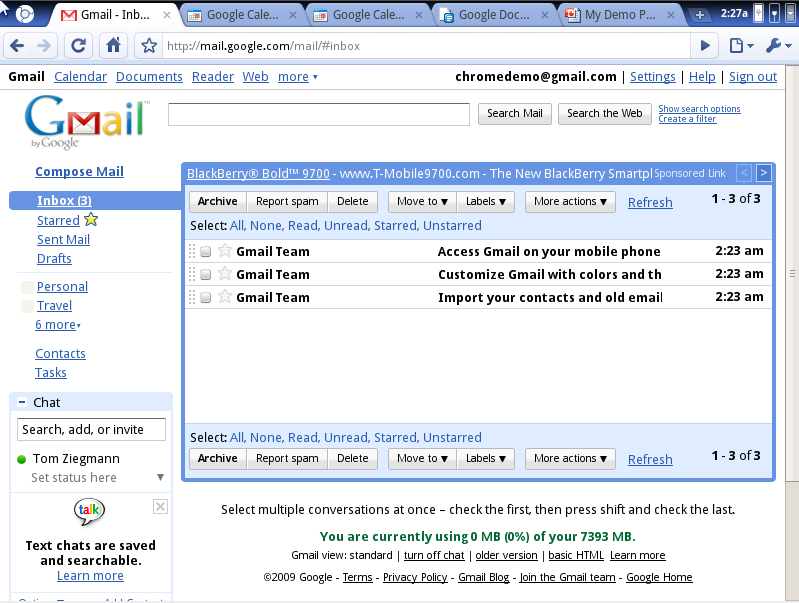 A review will posted soon, but for now, here are some early screenshots from Chrome OS for your enjoyment. *Official builds are called Chrome OS, unofficial or dev builds are called Chromium OS.